ESA’s Mars Express celebrates eight years in space with a new view of ice in the southern polar region of Mars. The poles are closely linked to the planet’s climate and constantly change with the seasons. Their study is an important scientific objective of the mission. About two-thirds of the image is covered by part of the southern polar ice cap and other scattered ice deposits, near a feature known as Ulyxis Rupes. The left side of the image is dominated by the polar cap’s ice shield, which is covered by dark dusty material that hides the bright ices beneath. At this location, further than 1000 km from the south pole itself, the ice is relatively thin: radar data indicate it is only about 500 m thick, whereas near the south pole it can reach more than 3.7 km. However, on the north-facing cliffs the layers of ice and dust are discernible. These form part of the polar, layered deposits. The cliffs are often curved, which could mean that they are shaped by underlying impact craters. The elevation of this region decreases markedly from south to north, dropping in steps by about 1500 m in total from left to right across the image. Just northward of the ice shield, about halfway across the image, there are large ice deposits that are heavily covered by overlying material blown into long dunes by the prevailing winds in this region. The orientation of the dunes suggests the wind must come predominantly from the northwest. With increasing distance from the south pole, ice becomes confined to larger impact craters, such as the one in the top right of the image. These provide the best shelter. The ice itself is slightly offset towards the north because, with the sunlight coming from the north, the southern walls of the crater tend to warm up more, causing the ice to melt. 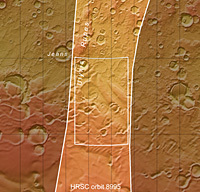 Ulyxis Rupes is a large cliff and is the only named feature in this image (‘rupes’ is the Latin term for cliff). With a length of 390 km and a height of up to 1 km, it is just visible at the top right of this image where it intrudes on the immediate left of the crater there. Puzzling parallel structures in the martian dust can be seen in the bottom right quarter of the image. Although their origin is uncertain, it is possible that they are the result of underlying ice deposits, permanently frozen because they are protected by overlying dust and rocks. The image was taken in January 2011, during the southern spring on Mars. At the moment it is summer there, but when the southern winter begins in March 2012, the temperatures will drop again and more ice will accumulate. Mars Express will be waiting. The story was originally published by ESA with high resolution images here.